One of the most common things I hear from people is … Should I start a blog? However, over the years I have boiled down my thinking to 5 things to consider before starting a (corporate) blog. Note: I put the word “corporate” in parentheses. A personal and corporate blog are very different things. One can reinforce the other, but they are separate things and generally should be treated as such. You may be wondering … Why should I consider a corporate blog as part my career path? The answer is simple. It’s a great way to stand out and be recognized for your unique skill sets. As you grow your career the ability to crisply and cogently describe something can help you Stand Out in Your Career. 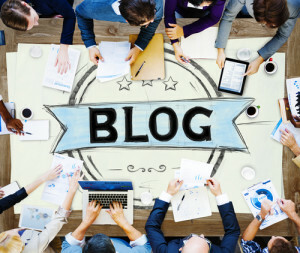 A corporate blog post is a great vehicle to share your thinking, perspective and expertise. This is one of the hypotheticals I usually pose to people when they ask about corporate blogging. While the responses range from “yeah, sure” to “I guess” to “I really don’t know” the reality is it’s a bit of each of these and a whole lot more. Reality Check: Blogging is hard work. It takes creativity and consistency to develop quality content. The five questions are listed below. I will provide a bit of detail about each question and a few areas to consider and evaluate. If you cannot answer all five immediately that’s OK. However, these five questions can be used as a checklist to think through the process of developing and growing your corporate blog. Where do I get the ideas & content? How do we make it popular? None of these questions should shock anyone. My thinking points about each are subjective too. Depending upon your goals and objectives with a corporate blog you might take a completely different angle of approach. Use these questions as a guideline. For more information you may want to listen to the presentation I delivered at the Microsoft Worldwide Partner Conference (WPC) in July 2015. Where I covered these points in a 30 minute session at the Social Hub. I’m sharing these points here because the audience for the Personal Branding Blog may not have been attending the WPC in Orlando. Of course, the first question is obvious. Why? Why would anyone, any organization want to have a corporate blog. Some of the answers I typically come back with are below. Feel free to add a comment here with your ideas. Show Authenticity – You are the expert. Share what you know. Share your Expertise – Giving Back, Growing Your Business, and Building Your Career. Question 2 – Where do I get the ideas & content? There are five obvious places you can seek content. Your own mind and experiences is the first one. What you know is unique. You have a perspective that no one else does. Tell your perception of the story. Seek some of the others to validate, corroborate or even counter your points. Employees – Your peers and your management team are great sources for insight. They have their own perspective. Consider capturing what they know and highlighting their efforts. Partners – Again, they have a vested interest in your mutual success. Ask them for ideas, contributions and opportunities to collaborate. Industry – Every industry has experts. As you build up your expertise seek them out. Soon enough you will be the one being called upon. Pro Tip: Get a PR Release in place. If you are going to mention a customer or partner make sure you have a Public Relations Release in-place. They may be flattered to be mentioned. The last thing you want is them to be is surprised. Question 3 – What do we expect to achieve? Break into new areas: Vertical Markets, Sales Regions, Launching Products, New Partnerships, etc. Give Back – Don’t discount altruism. Question #4 – Where do we put this stuff? There are a lot of options here. Dozens of tools are available. Some of the most common are WordPress, Medium and LinkedIn. Each have a lot of traction and wide adoption. Worth a Look: Microsoft just announced integration for Office 365 with IFTTT. Question 5 – How do we make it popular? This is a bit challenging and changes by industry. Asking for retweets, likes and +1’s is not a crime. If someone took the time to read your content you SHOULD make it very easy for them to share it. Put buttons in prominent places for the social media channels where you want your content to be shared. Also, make it very easy for people to subscribe your content. Pro Tip: If you see your content being shared on Social Media sites you aren’t familiar with take the time to investigate them and consider posting there directly. In the case of LinkedIn you might have a very nice built-in audience by posting to groups. LinkedIn Groups are fantastic resources to sanity check an idea and to ask for help getting the word out. Also, consider submitting to your content to your current or target industry publications as well as industry trade shows. Every industry is looking for an angle that helps them drive the same points in question number one. When you take the time to think through what you want from a corporate blog then you can think through these points and start building your editorial calendar and getting your first posts out. It’s never easy, but with a checklist the process can become more automated and focused. As your skills at content capture, creation and curation improve you will Stand Out in Your Career. Good luck with your creation of a corporate blog. If you have great examples of corporate blogs please share them in the comments here. I’m sure you have at least a few that you rely upon today to get your job done. Perhaps you can emulate them and begin building your own content, awareness and brand.